The Murrieta Valley High School girls basketball team’s season has come to a close after a loss to Newbury Park in the second round of the CIF Division 1A playoffs. The Nighthawks lost 58-50 on Wednesday night, but gave the Panthers a run for their money in the final minutes of the game. Murrieta Valley ends its season with an overall record of 21-7 and a league record of 5-5. While the Nighthawks may not have ended the season the way they may have liked, they still have much to be proud of. This includes their season-long defensive performance, which was on display on Wednesday night. "I think that we came out stronger than anyone thought and for a lot of new freshman on the team, we played really strong," said senior Alex Morrison. At the start of the final period, Murrieta Valley trailed by 15 points, but had gained momentum. With less than a minute remaining in the game, Murrieta Valley had allowed Newbury Park to score only five points since the start of the fourth quarter. "We tend to have a fairly good defense, and we try to use that to get into our offensive transition, but they did a good job of slowing us down when it came to that tonight," said coach Scott Richards. "We were able to at least force a lot of turnovers and try to limit the amount of points that they can score." Murrieta Valley came within six points of Newbury Park after trailing by 18 at one point in the game. "I love that we didn't give up and the tenacity we showed and I’m proud of how we came back," said Richards. 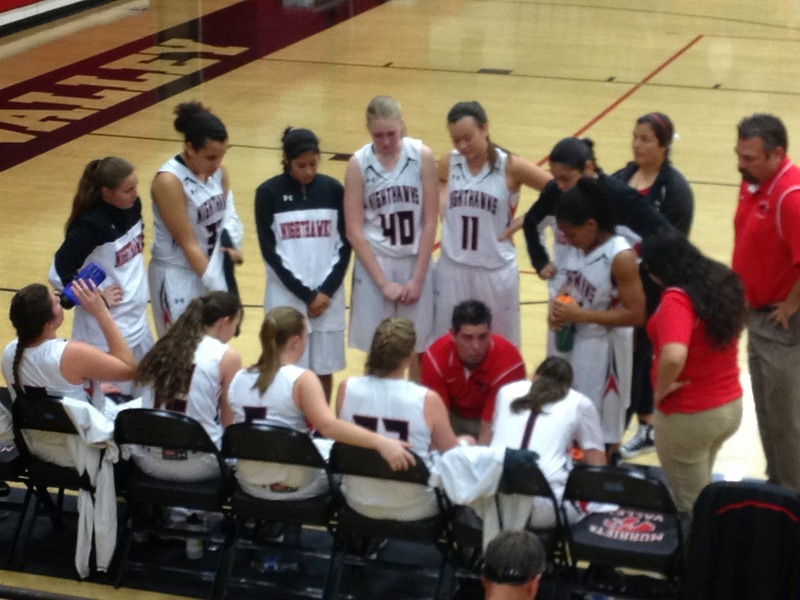 Murrieta Valley’s offense struggled early, scoring only five points in the first period. However, the Nighthawks picked it up in the second and third, entering the final period with 32 points. Junior Ariana Hernandez led the team with 13 points in the game, including four 3-pointers. Senior Julia Cardenas also contributed with 11 points. Morrison had 10 points, with four crucial free throws in the fourth quarter to keep the Nighthawks in the game. "I think we started playing more as a team than individually and then we just knew we really wanted it so we gave all our effort out," said Morrison.